I think the rain is wreaking havoc with my Internet. I could not blog last night for anything. I watched my computer screen for a good 15 minutes waiting for Blogger to load. All was not lost. I'm reading a very interesting book recommended by my daughter Alison, The Life-changing Magic of Tidying Up. This book is perfect for my frame of mind right now! I've been spending a lot of time reorganizing space since school ended, and reading this book is giving me incentive to carry on! I'm sure it's not for everyone, but I'm enjoying it! I don't have much to show for yesterday. I did finish four more lavender pillows. They're so easy to make. My one disappointment is that my fabric stash is not dwindling nearly as quickly as I thought it might! Other than the pillows, my day was filled with grocery shopping, chatting with daughter Alison on the phone, tidying my tatting corner, cooking, and playing with Sophia. I only have a few more days with Sophia and Joanne, so I have to make the most of our time together! The first hand-dyed thread artist I learned of was Marilee Rockley. When she would post about her hand-dyed threads on her blog, I would rush right over to her Etsy shop to purchase whatever new thread colors I could afford. I was thrilled when I learned that she was going to be at a craft show in the Milwaukee area, a mere four hours away! That was back in 2007. My, how time flies! Daughter Alison and I made plans to go, and although it wasn't a huge event, I was thrilled beyond belief to get the chance to meet Marilee in person! Alison and I purchased some goodies from Marilee, and then took the obligatory look at other vendor stalls. I'm glad we did. I met a woman who made lavender pillows. She told me they were wonderful for headache relief. I was sold! I'm a wimp when it comes to headaches, and I will try almost anything to get rid of them quickly. I followed the directions and put the pillow in my freezer. Luckily, I don't need it as often as I did when I was younger, but I'm always glad to have it when a headache rears its ugly head. After a few years, I decided I needed a second lavender pillow. I found some online, but all of them were much smaller than my original pillow. Last week I decided to look on Etsy, and I found one the size of my original, 6" x 12", and the cost was only $26... $26???!!! Yikes! I went shopping for supplies on Amazon, and purchased buckwheat hulls and lavender for just over $20. The supplies arrived yesterday, and today daughter Joanne and I worked on making lavender pillows for all the girls in the family. We have five pillows made and we still have supplies left, so we'll probably make some more tomorrow. These are lighter weight than my original pillow. I'm guessing that it is filled with flax seed and lavender, because I've read that the flax seed adds weight. For now I'll stick with the buckwheat hulls. Joanne and Sophia helped Grandpa wash his car yesterday. Today she helped Grandpa mow. I think farm life suits her! I know the song is "Rainy Days and Mondays," however here in Illinois it rained almost all day Friday. I wish I could send some of it to some of you who are experiencing severe dry conditions. We really don't need any more. With all the rain, there really wasn't much for the kids to do outside, so we made pillowcases! The kids chose their fabrics. Eva did most of the sewing on her pillowcase. Aidan supervised the making of his. This is my favorite pillowcase pattern, called the Burrito style. Directions can be found here. I like this pattern because there are no raw edges, and it makes up quickly. Last night the kids wanted to watch RV with Robin Williams. The language is a little rough, but it is very funny. While we were watching, I finished up another dishcloth. The kids love the zebra look! I found a pattern that was just the right size to cover my stone coaster! Now I don't have to worry about tipping my glass of water over, and the cotton is super absorbent... no more condensation dripping on the table! I finally took the plunge and restarted round 10 of my Jan Stawasz Masterpiece. I had a couple of false starts, probably because I've been a little distracted this week, but I'm happy to finally be back on track with this beautiful doily! Yesterday was kind of a lazy summer day. The weather was perfect for playing outside, so Grandpa Dave helped the kids build an outdoor water bed and a water canon. The water bed leaked like crazy, but the kids had lots of fun drenching each other. What could possibly be better than a yard full of kids and water shooting everywhere? Daughter Carol and grandson Aidan grilled hamburgers for dinner. We all ate until we were stuffed, and then we watched a little t.v. The only crafting I managed to accomplish was to crochet one coaster. 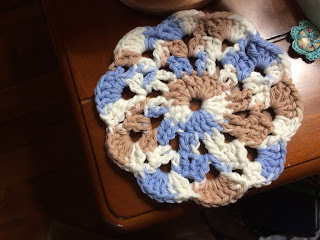 I found this pretty coaster pattern for free. I wanted one that would fit on top of my stone coaster. I drink a lot of ice water in the summer, and the stone coaster just can't absorb all of the condensation. This one is just a little too large. I'll either try crocheting this pattern in sport weight cotton rather than worsted weight, or I'll find a smaller coaster pattern. 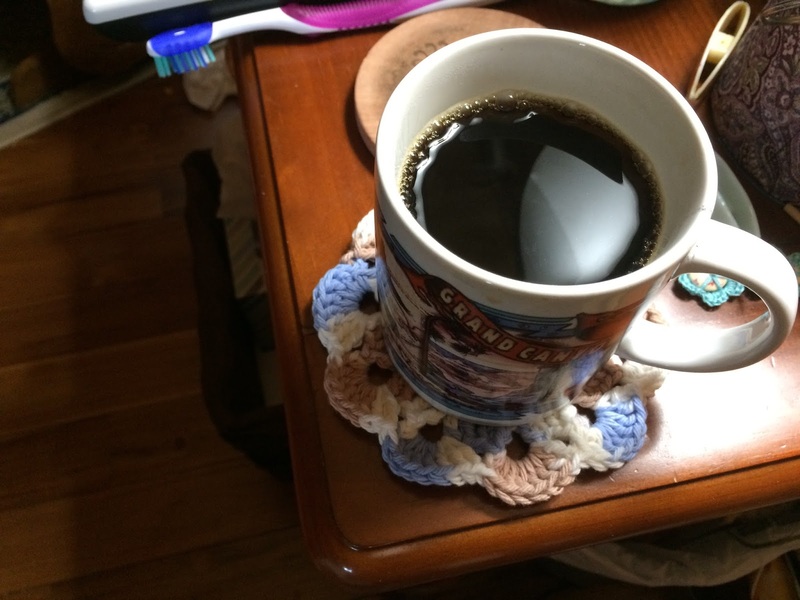 I want it to be the same size as the stone coaster so that I don't miss and set my cup off the edge. You know what a mess that would create! Yesterday was road trip day, driving up to daughter Alison's house to pick up Alison and her two kids to come visit Grandma and Grandpa for five days of fun! About a half hour after I left, daughter Joanne called to say she was locked out of the house. Little Sophia had escaped out the front door and Joanne quickly followed. Luckily, she was just finishing up a phone call and had a phone in her hand! Dave was able to come home and let her in, or she'd have been stuck on the front porch until Alison, the kids, and I returned around 4 p.m. Daughter Joanne is doing her Vanna White impression, showing off the newly organized closet space. Which door would you choose? Door #1? Door #4? Believe it or not, there are no tatting supplies here! You will find fabric, knitting, crocheting, weaving, and bobbin lace supplies. I think I'm set! Did you notice that LadyShuttleMaker's Etsy shop has reopened? I love Sherry's ceramic shuttles, and I've been collecting them from the beginning. I think I was her second or third shuttle customer. Yes, you do have to be careful not to drop them. They are ceramic. I love the weight, and many of them are musical... there's a little musical ping as the thread passes through the tips. I've purchased at least one shuttle each year. I'll post a picture of my collection one of these days. This is a slightly larger shuttle in my favorite color, blue! Thank you, Sherry! I love your little works of art! Another package arrived in the mail yesterday. This was my latest purchase from Jane Eborall's Etsy shop. I love Jane's All Square Tat Bag! It's great for carrying projects in my purse. You do carry tatting projects in your purse, don't you? I was really excited for the latest release of Pop-A-Bobbin shuttles created by "'im in the garage." This is probably the fourth time that I've been lucky enough to purchase the shuttles I wanted after seeing Sally's post about new shuttles. Who wouldn't want a shuttle made of Raspberry Jam? I think I might crave toast and jam while using this shuttle. I also wanted the Laburnum shuttle. I guess it was my lucky day! Sally, please thank 'im in the garage for his fabulous shuttles, and Jane, thank you for listing them in your shop. You two ladies help feed my tatting supply addiction! Daughter Joanne chided me for getting behind with my blog posting, but I do have a great excuse... Joanne has been cracking the whip and forcing me to organize my craft supplies. Yes, it has taken since my last blog post to accomplish this, and I'll be honest with you... I'm not finished! I have no pictures just yet. It's too dark this early in the morning, and Joanne and Sophia are still sleeping, but I can tell you that it's either impressive or very, very scary! A huge closet upstairs is now filled with bins of craft supplies that have been organized and labeled. I can find what I'm looking for! I still have some work to do in my sewing room, but it's now manageable. I have absolutely no reason to shop for one single craft supply. We found beautiful fabric, yarn in every size, beads galore, enough thread and tatting shuttles to open a shop... it's all a bit overwhelming! We did take breaks to play with Sophia and time to rest. I finished this blanket for our new baby girl due in September. I think it's rather plain, but Joanne likes it. Sophia loves socks and while we were reorganizing, I found a bag of socks just waiting for lace edgings. Luckily, I had Sophia's size! Joanne told me which colors she would like, and I went to town! I love knitting my own dishcloths, and I happened to find one in progress. Daughter Carol said she would like to have two, and since I have enough cotton to last me a lifetime, I had no problem with fulfilling her wishes. Today I'm off to pick up daughter Alison and her two kiddos. They'll be staying for the week, and Grandpa has some fun projects picked out to do with them... a water canon and an outdoor water bed. Let's hope he can keep the mosquitoes at bay! Today was a day for organizing, so there wasn't much time for crafting of any kind. I did take some breaks and when I did, I chose to doodle. 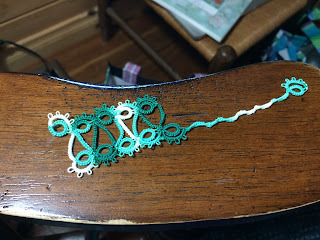 I emptied one shuttle with this pretty little pattern from Tatting Lace, the book I showed on yesterday's post. I'm not fond of the length of thread that passes under the rings, but I imagine those threads could be hidden as the piece is sewn down. I do like the way the pattern flows. With daughter Joanne's encouragement, I spent most of the day reorganizing my sewing room. It's far from being finished, but I did make good progress. Tomorrow we're going to visit daughter Carol, so no work will get done, but Joanne and I already have plans for Saturday! ...another bookmark for daughter Carol. I was using up thread on two shuttles, so it's kind of short, but Carol likes it. This is an insertion pattern. I'm not sure I tatted it correctly. I don't read Japanese, so I was just looking at the diagram. I'm not sure I switched shuttles or reversed work correctly, but it still looks nice! I also tatted this 3 1/2" motif. This one was very easy, and it's just the right size for a piece in my curio cabinet! Joanne and I were working on organizing my sewing room. I found some socks that I had purchased specifically for adding crocheted edgings. I used to do this for my daughters and my older granddaughters, so why not for Sophia? What do those numbers mean? Today is my 8th blogiversary and my 63rd birthday. I've had a lot of fun for the past 8 years, and I owe my blogging inspiration to Sherry Pence aka LadyShuttleMaker. Did you know that she's back to blogging? Yippee! Without Sherry's encouragement, I might never have started blogging. So, thank you, Sherry. Daughter Carol is working on her master's thesis in history this summer, the denazification of Prussia... a very deep topic to my way of thinking. She asked for some new bookmarks to help with her research. Her students call her CC, so I thought it appropriate that she have a CC bookmark. She loves it! Sophia decided to join Mommy in a footpath, very relaxing for both of them! Sophia's new favorite toy is her bubble machine lawn mower. She has spent hours mowing the porch! I finally finished another baby blanket for Joanne's baby boy... time to start another for baby girl! All in all, it has been a wonderful blogiversary/birthday! It's been a busy two days since my son-in-law Jan brought daughter Joanne and granddaughter Sophia down to visit. Jan is already back home in Minnesota, working hard. The rest of us have been busy playing! Right now, Joanne and Sophia are napping, so I have a few minutes to blog. Sophia helped Grandpa fill the planters on the porch. She wandered through the garden and played in the treehouse and on the slide. and watched the water fountain and waterfall, with toes being tickled by the grass! A little t.v. never hurt anyone, especially when time is taken out for dancing! Of course, I did manage to find time to crochet some more button flowers. Joanne asked how many I had finished, so I counted. 210! Maybe it's time to start attaching them to headbands and hair clips! I also managed to find time to tat another snowflake from Robin Perfetti's newest collection, which is now available in her Etsy shop. This one is Eclipse, a very pretty pattern, and so much fun to tat! Now that I've taken care of business, should I take a nap or start another snowflake? Decisions, decisions. I forgot my own birthday party! My friend Peggy called about 4:30 yesterday, worried about me. Our Soup Club was supposed to meet at 4:00 to go out for dinner to celebrate Judy's and my birthdays. I was so busy enjoying myself, that I totally forgot it was Friday. Good thing Peggy called... our dinner at the Japanese steak house was delicious! After dinner, we went back to Peggy's house where Edna had fun activities planned, and she made one of her fabulous cakes! I've known these ladies for 30 years, and we always have a great time. Peggy is a retired 5th grade teacher, Judy retired from teaching 3rd grade, and Edna is a kindergarten teacher. We used to try and get together once a month, but somehow life has gotten too busy. We always get together for Edna's birthday in September, Peggy's in April, and Judy's and mine in June. I feel very lucky to have such wonderful friends! So what had me so distracted? I decided to clean and rearrange my hutch, a project I really get into once school is out. The hutch belonged to my mom and dad, and I was lucky enough to acquire it when they moved from their house to their retirement village ten years ago. Of course, that means washing and blocking all the doilies that decorate it! The white doily at the top left goes on my coffee table in the sun room, and the coffee colored one under it goes on top of my curio cabinet. The rest decorate my hutch. 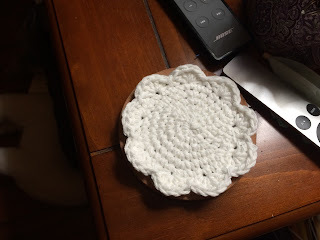 I was up early this morning, and most of the doilies are now back in place. Three of the thicker ones are still damp, so they'll need the rest of the day to dry out. I wonder which detail project I'll take on next? The curio cabinet is in dire need of dusting. We'll see! I did tat another Noelle in Aunt Lydia's. The pastel thread was a little rougher than the others, making it a little more difficult to close the rings. I thought it was interesting that the opposite points of the snowflake match. I don't think I've ever had that happen with a multi-colored thread before. Robin's pattern pack of snowflakes is now available in her Etsy shop, and I highly recommend her beautiful patterns! Could it be the dye?